Well, DadsWorksheets.com is now officially one year old. We’ve come a long way. We’ve seen over 300,000 visits to the site that generated over 2.25 million page views. And of course, 3,937 free worksheets. We’re about to start another school year, which will be fourth grade and kindergarten here. I’m looking forward to the challenges that a new school year brings, and hope you’ll stop by to share in the fun. It will be great to see where we’re at in another year. Thanks for everyone’s support! For years, Dad was a two-OS guy, with two computers (a Mac and a Windows machine) whirring away on the desk. I was multitasking before multitasking was even a word, but I did most of the day-to-day computing on a Mac. In fact, all of the business accounting still happens on an ancient PowerMac G3 that I’ve dredged out of the closet annually for the last decade or so. But, at some point it just made more sense to only upgrade, backup and power one computer, and since the day job involved building Win32 applications, there wasn’t much choice in which OS I wound up with. Until now. Alright, so I know the Python programming language is actually named after the Monty Python group, but after all, the language’s logo (shown here) is a pair of snakes. One of the great things about the site is how easy it has been to build the worksheets using Python, and it’s definitely gotten me out of some jams. Like today. I built all of the recent geometry worksheets using graphics saved in PNG format, which is a loss-less file format, making it somewhat more attractive relative to the older JPEG format. PNG isn’t a terribly new file format, but some people (including my wife) have had trouble printing the new worksheets. What I really needed to do was convert the 361 PNG files on which I’d labored over into JPEGs and then regenerate the worksheets. Not much fun for a lazy guy like me. Over 3,000 Worksheets and Counting! If you have any requests or ideas for additional worksheets that you think would fit in with the other material here, feel free to post a comment to this post. I’m sure there are lots of great ideas out there and your feedback is appreciated. Meanwhile, I hope you’ll share the enthusiasm and pass word about the site to parents or teachers whom you think might appreciate the content here. If you have a blog or a web site, a link helps greatly spread the word. Thanks for your support and see you at 4,000! Dr. Donald Crawford paid a visit to DadsWorksheets.com last week and suggested perhaps renaming the worksheets posted here to avoid conflict with the commercial Rocket Math curriculum he has developed over at http://www.rocketmath.com. You can read the discussion at the bottom of the Spaceship Math Strategy post, but given that this is supposed to be a low-stress activity on my end, changing the names of the worksheets to address everyone’s concern was definitely easy. 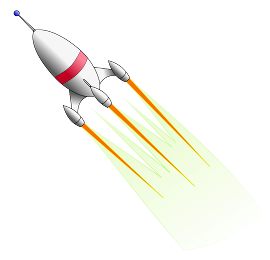 Meanwhile, if you’re a teacher looking to purchase a full curriculum for Rocket Math, be sure to check out Dr. Crawford’s new web site at the link above. Whew! The site is now fully over on to WordPress and all of the old content has been migrated to posts. The home page for the site now redirects right here, so if things look new (that is to say, if you haven’t been reading the blog previous… tsk-tsk!) please have a look around. The RocketMath strategy content has been reworked slightly, and maybe this will generate some interest in those check-off pages I put together a while back. The worksheet accordion navigation below uses MooTools… This came out quite nicely and should be a little easier to negotiate especially as more worksheet categories come online. Eventually I’d like to get this into the worksheet sub-pages as well, but for now those pages still use the older CSS pop-up navigation. There is some fancy cross-linking between the actual math worksheet pages and all of the landing pages have been redirected to appropriate posts. If anything winds up broken, please post a comment here. Otherwise I hope you enjoy the new look… Back to some actual content for me!